So Thursday night of the 12th July saw Anna and I making a rapid ascent up from the Königsee towards the Funtensee, a lake perched at about 1,700m in the Berchtesgadener Alps, right on the border of Germany and Austria. Our planned destination was the Karlingerhaus, a mountain hut where we had planned to spend the night. Having set out late at almost 5pm for what was signposted as a 5hr journey, we wondered whether we would make it, especially at it was raining hard. This made conditions underfoot, on what was a very steep ascent, harder going, and also meant the light was fading quickly. In the end we needn’t have worried, as we made the climb to the hut in exactly three hours, arriving a little before 8pm. The hut was a very welcome sight nonetheless, and it was nice to hang up wet waterproofs, get the boots off, and step into what proved to be a very cosy and welcoming hut. The lake by the Karlingerhaus, the Funtensee, has a particular record attached to it. It has recorded Germany’s lowest ever temperature, at a staggering -46.9 degrees C, just ten years ago. Caused by its North Easterly position in the mountains, it gets practically no sun for six months of the year, and it also sits in a depression. Due then to the fact that cold air is heavier than warm, when the cold air comes down from the mountains above, it has nowhere to go, and just sits there. There was however no cold to be seen this night, despite the rain, as the hut was packed with people, and each of the dining rooms (three rooms in total) was full of revelry. In fact it was so loud you could hardly hear yourself think! I have never been in a hut and seen so much alcohol consumed! Having eaten some delicious potato soup with sausages, and had a couple of very welcome German beers, we ended up sat in the middle of what became a schnapps-fuelled signing contest between German and Dutch climbers. We ended up having two choices – which was to sit in a corner and watch, or to join in, so we chose the latter. It was about as raucous a night as you will see or hear in a typical rugby club on a Saturday night post-match – awesome entertainment is all I’ll say! Waking the next morning with a fuzzy head was soon eclipsed by the feeling of waking up in the mountains. There is something so absolutely wonderful about it for me. It is the antithesis of any time you wake up on a normal Monday morning and think “oh bugger I have to go to work today”, and such a tonic. Even when I stay in the highest alpine huts and have to get up at 5am it is still that same “let me get at it” sort of feeling. The bleak landscape of the stony sea was exacerbated even more by the weather that faced us. It started with rain, and then just basically got wetter. 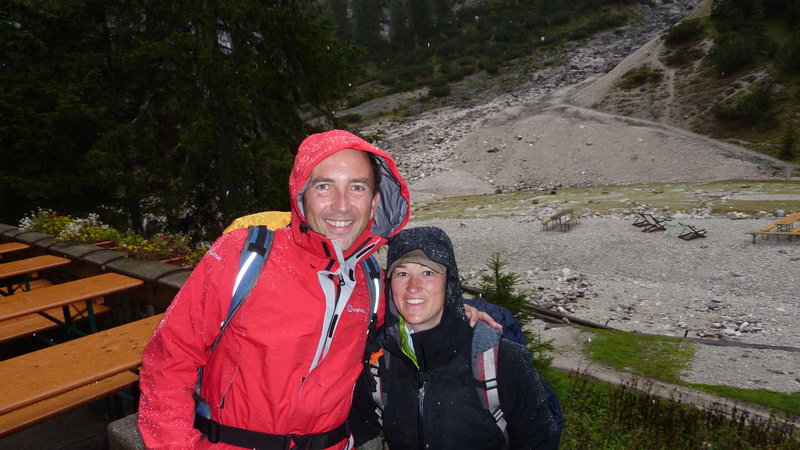 Setting out from the Karlingerhaus before the weather got bad…. but entering the Stony Sea it sooned turned cold and wet. The Stony Sea was hard work in the weather. The rain lashed down, visibility was low, and the wind blew hard. I hadn’t expected to be decked out in full waterproofs, including gloves, and still be cold, in July, but that’s the mountains for you, and shows you that you always need to be prepared. 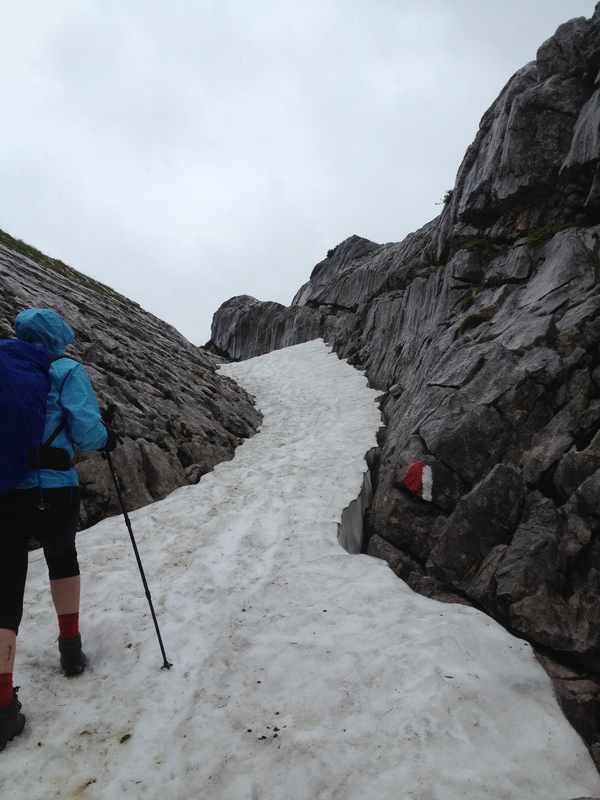 Some of the paths were still covered in deep snow, and with the cold and wet air it made some of the conditions underfoot a bit heart in mouth at times. We had originally hoped that once in the Snowy Sea area that we would be able to do a couple of the peaks that are around there. There are around 50 peaks with a prominence (i.e. above the base of the area, which all sits at over 2,000m) of over 50 metres within the area, and a total of around 20 above 2,500m. Two of the best known are the Breithorn and the Schönfeldspitze, both around 2,600m. Sadly we couldn’t even see them due to the conditions, and so we ended up just heads down and heading for some cover at the next destination, the Reimannhaus hut. The Riemannhaus in sunnier times, not quite the view that we got. I did not even get my camera out so hard was the wind and rain as we approached. I also ended up with the contents of my rucksack soaked through, as the wind had (unbeknown to me at the time) ripped off my rucksack raincover somewhere on the way there. I have almost never been so glad to get inside a building as at that time. The hospitality in the hut, once we had squeezed the water out of gloves and my rucksack contents, was wonderful. We also had what I can only describe as the best Goulash that I have ever had. It was absolutely delicious, and washed down with a steaming mug of black tea it made for one of the most memorable meals I have ever had. 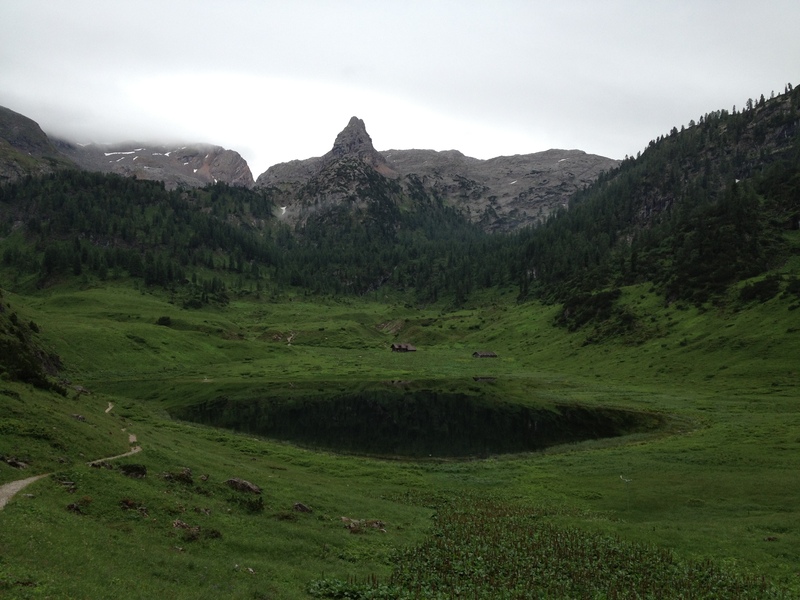 Berchtesgadener Alps – Day one, or part of it…. Having been back from the Karwendel Alps for about four days, I was already missing the mountains. The Karwendel having been my first trip of the year, and my big trip in December (Aconcagua) being seemingly so far away still, it was nice to carry on thinking about them and plotting potential new adventures too. And so I found myself talking to my good friend Anna, with whom I regularly cycle, over dinner, and telling her about my most recent adventures. It became clear about half way through dinner (or maybe it was after about 20 seconds, my memory fails me :)), that Anna was not just interested in hearing about the mountains, but that she (can I use the word desperately?) wanted to go too. To cut a long story short, before the main course was over, we had not only decided to go together, but it also clear that the only weekend available to both of us was the very next one, and so, with my trekking gear not even unpacked from my previous trip, I found myself back on the way to Heathrow to fly back to the Alps. Oh well, go on then, twist my arm!! 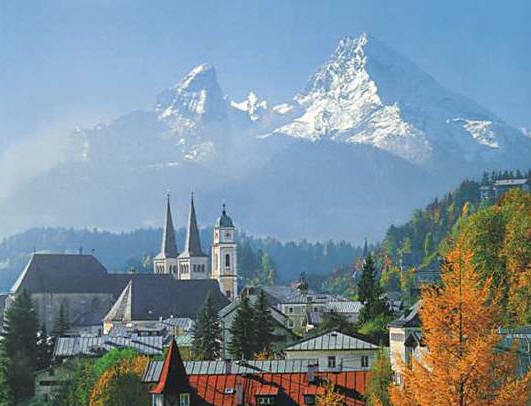 The trip 10 days before had initially involved a choice of destinations, and one of the potential options then had been the Berchtesgadener Alps. 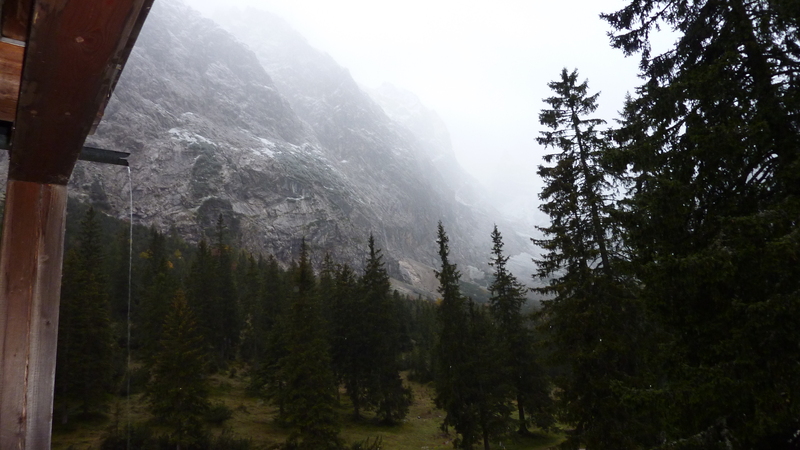 We instead went to the Karwendel, but having been to the town of Berchestgaden some 20 or so years before, I was very keen to go back, the area being outstandingly beautiful, and steeped in somewhat notorious history. The Berchestgadener Alps are in the Northern Limestone Alps, and straddle the south eastern corner of Germany and part of northern Austria close to Salzburg. 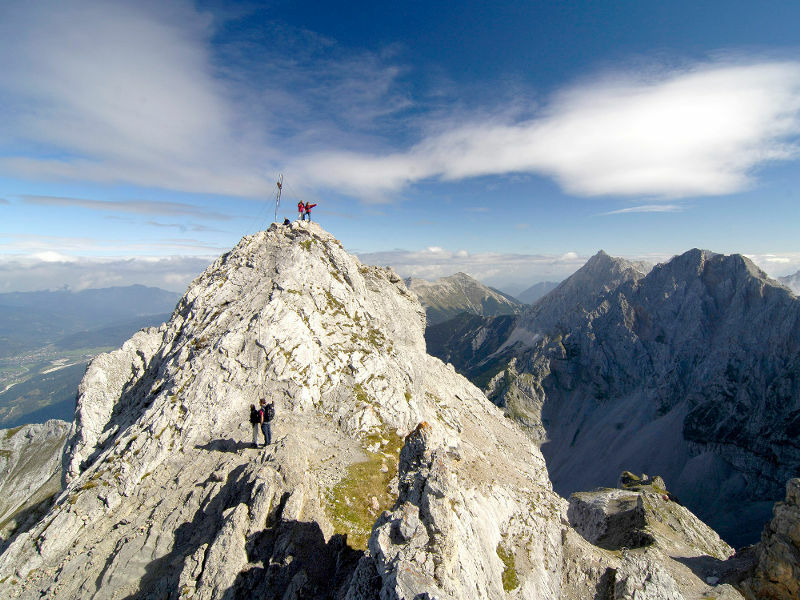 The mountains lay host to a number of notable peaks, the Höchkönig, at 2,941m (9,650ft) being the highest, and the Watzmann, (2,713m, 8,901ft) Germany’s third highest, being the most famous. 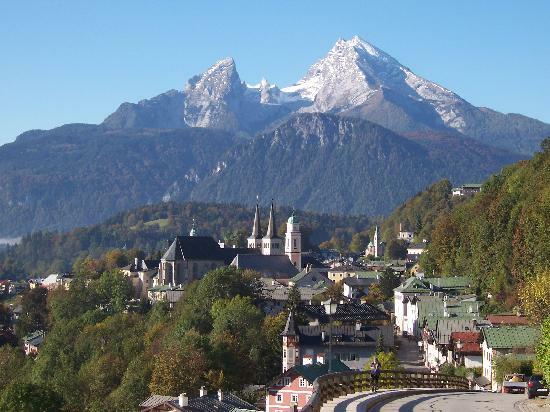 The notoriety in the area comes from the area the other side of Berchtesgaden itself, known as the Obersalzburg. It was here during WW2 that Hitler had his mountain retreat, known as the Eagle’s Nest, reportedly also the last place to be liberated in the war, and then home to caches of Nazi Party stolen art and other treasure hordes. Our trip would see us drive from Munich to Berchtesgaden, and the Königsee, a beautiful lake just south of the town. 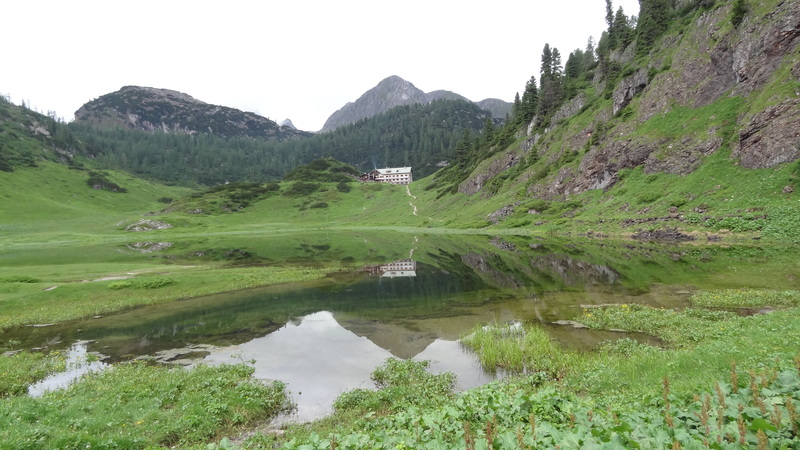 We would then trek up to a place called the Funtensee, and stay the night in a hut called the Karlingerhaus, before heading further into the mountains. 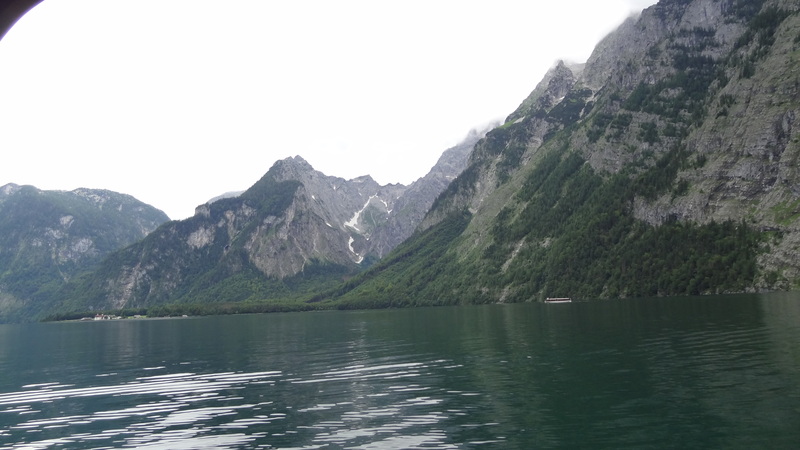 The Königsee is one of the deepest in Germany and certainly one of the most beautiful. It is flanked by the Watzmann mountain and is like a fjord, having precipitous cliffs on all sides. It is also reputedly the cleanest lake in the country (and that is clean, believe me), and so only electric boats are allowed to travel upon it. Arriving at the Königsee at about 4pm, having hurriedly armed ourselves with a sandwich, a map, and some water for our Camelbacks from nearby Berchtesgaden, we trekked down to the lake for our departure by boat. I had found out literally only that morning from Verena (who I had been with to the Karwendel) that we must cross the lake by boat to begin our trek. How exciting! Verena was fantastically helpful in terms of getting me last minute information for this trip and so I must thank her publically here for all she did. The lake really is stunningly beautiful, with water a beautiful aqua green, and yet crystal clear with it. 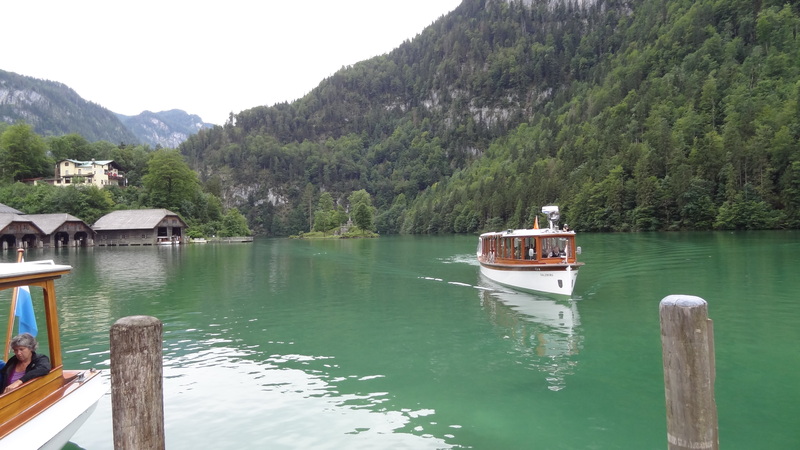 The electric boat would take us to a settlement called St. Bartholema, from where we would begin the climb up to the Funtensee. Stepping off the boat after about 45 minutes we got our rucksacks adjusted and ready for the off. The boat had stopped half way along the lake on the way so that the driver could play a flugelhorn at the cliffs and the passengers could listen to the echoes (reputedly up to seven!). This might have been quite nice if we had been tourists, but we just wanted to get up the mountains behind. On our way down the lake on the boat, St Bartholoma in the distance. As we started our trek, I looked at the first signpost, which said “Karlingerhaus 5 hrs”. This was immediately quite daunting, and I wondered if we should start walking at all. It would be dark by 9, and by then we would be high in the mountains, and it may well be dangerous to do the walk finishing in the dark. I therefore rang ahead to the hut, and told them that we were just leaving the lake. The helpful man who answered (him talking in German, me in English) managed to let me know that we could get there in 3 and a half to four hours, and so we decided to go for it. Having walked no more than about five minutes, we came across a German guy coming down. He asked us if we were headed up to the Karlingerhaus, to which we said yes. The guy stopped and just said “Kompliment!”. He looked more than surprised, looked at his watch, said a few things in German which I half understood (i.e. I half didn’t) and was on his way. This made us a bit nervous, as clearly he was intimating that people who started up a five hour walk at 5pm were a bit nuts. This only though served to spur us on. We knew that the hut was at about 1700m, and my watch showed that we were starting from about 630m, so we had a fair bit of ascent to do. It was basically therefore heads down from that point on. Today is a landmark day. I write that immediately after the end of the day itself, particularly as it has been so wonderful. 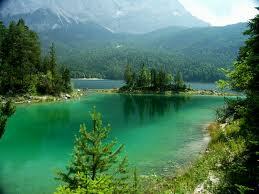 It is the first day of a five day trip to the Karwendel Alps in the Austrian Tyrol. (As I post this online however it is six days later – the date was the 28th June 2012). It is my first trip to the region, and I have been looking forward to it for so long. It started so early, with a 5am alarm call, and then a car ride to Heathrow airport which got me there before 7am. But despite tiredness early on, the day just got better and better. A plane ride to Munich got me into Germany before lunchtime, where I met up with Verena and her friend Susanne, whom I was meeting for the first time. We had only loosely planned the day beforehand, and so upon arrival they suggested that we go and drive to a place called Achensee, where we would stay the night, before heading into the higher mountains the next morning. This was totally fine with me, and so off we went. The car journey took us almost due South into Austria, and within about an hour and a half we were at a place called Maurach on the edge of the Achensee. I can only describe it as outstandingly beautiful. After finding ourselves a place to stay for the evening we then duly plotted the following three days’ events. 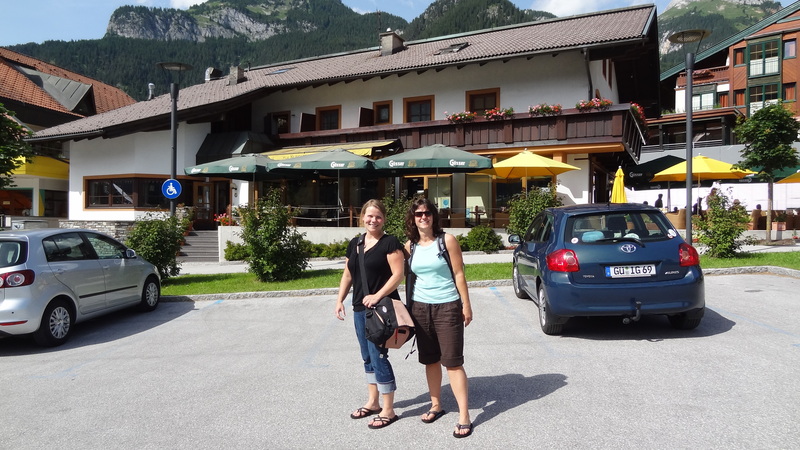 Verena had been really thorough and bought local maps and pinpointed all of the places we would go to in the mountains. 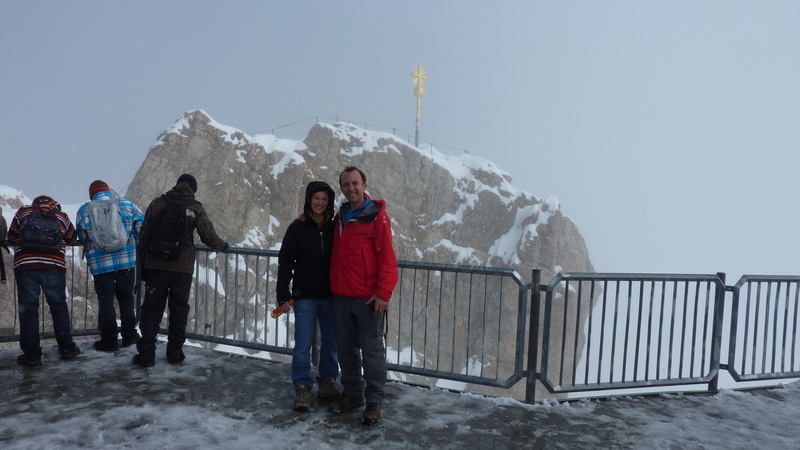 We planned to head the following morning to Absam (on the outskirts of Innsbruck), then hike up to the Bettelwurfehutte, and then summit the Grosser Bettelwurf (2,726m) the same afternoon. This sounded fantastic, and with everything sorted, we just relaxed for the rest of the afternoon and evening. 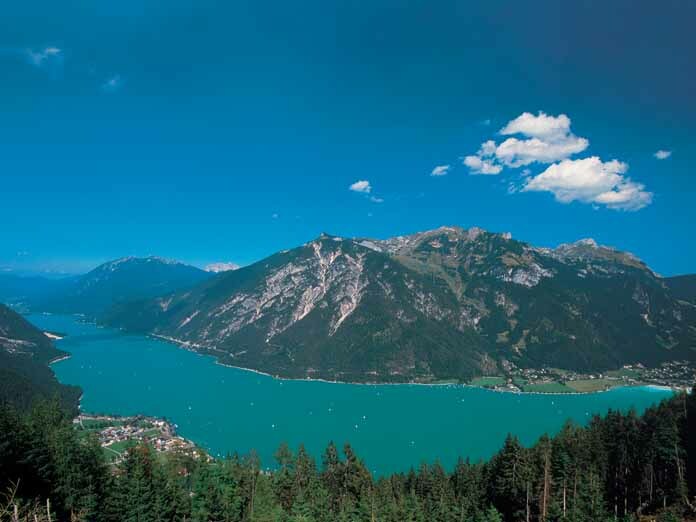 Maurach is at 931m and is characterised by a beautiful lake (the Achensee) which is a stunning shade of green. The temperature being so warm (around 27 degrees C or so) it just seemed entirely appropriate to go and join the locals and swim in the lake, so we did just that. It was wonderful, and the water was actually not as cold as I had expected it to be. In the evening we went in search of both food and also football! It was the evening of the Euro 2012 football finals, and Germany were playing Italy (who had just conquered England four days before on penalties in the quarter final). After straying into a very fancy looking hotel where I am not sure if they have ever even heard of Euro 2012, we found (of all things) an Italian Bar! The hospitality (especially considering Verena was fervently and excitedly shouting for Germany) was wonderful. Susanne is not as much of a football fan, but still obviously wanted them to win. After a great meal and a few Aperol Spritzers we settled down to the game, which unfortunately Germany lost 2-1. It made still for an exciting first night in the mountains, and Achensee made for a great base. We resolved at the end of the night to return on our way back on Sunday night. So with the build up complete, and a long day over, in the morning we would head out to the Karwandel Alps, only about 30 minutes or so away. It was going to be fantastic. Sleep would come so ridiculously easily….. So after a very quiet first half of the year for me, later this week I will this week get my first taste of the hills and mountains since I was in Nepal last autumn. I can’t wait to go, I really can’t. I will be travelling with a friend called Verena, and a friend of hers, name as yet unknown :). 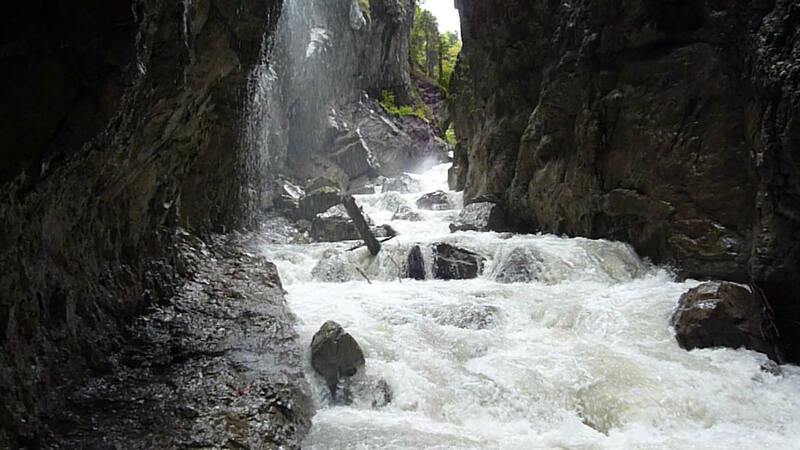 It is a short trip, of only three days in the mountains themselves. Verena lives in Bavaria, and has planned the whole thing, which is wonderful. We have been planning the trip for a few months now, and originally the trip was going to be to a route called the Heilbronner Höhenweg, in the Allgäuer Alps. The pass sits on the border between Germany and Austria, and is between 2,400m and 2,640m in altitude, with some nice scalable peaks along the way. Yesterday however, Verena contacted me to say that there had been unseasonably late snowfalls in the region, and that it may prove difficult or even dangerous to take this route. She advised that I take crampons to be safe. In fact she also said “there may be old ice and snow in certain areas where you could fall through and that would be it”. Now call me a bit of a scaredy cat if you will, but the words “that would be it” are a teensy bit fatalistic for me, so that got me a bit on the edgy side. 1. 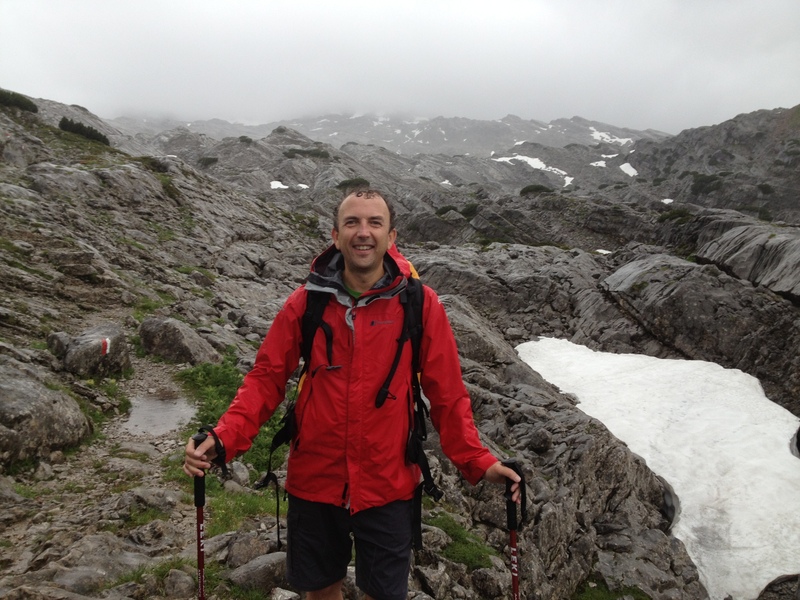 In the Karwendel. 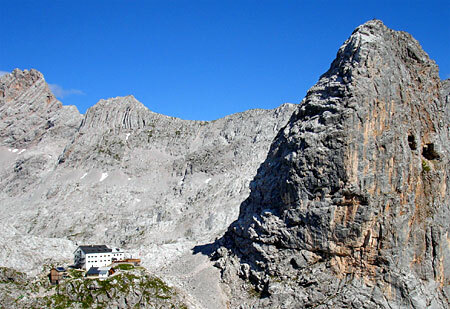 The route goes to the Spekkar Spitze and the Goetheweg. We would stay at the Bettelwurfhutte and the Pfeishutte. 2. In Berchtesgadener Land and the Chiemiger Alps. 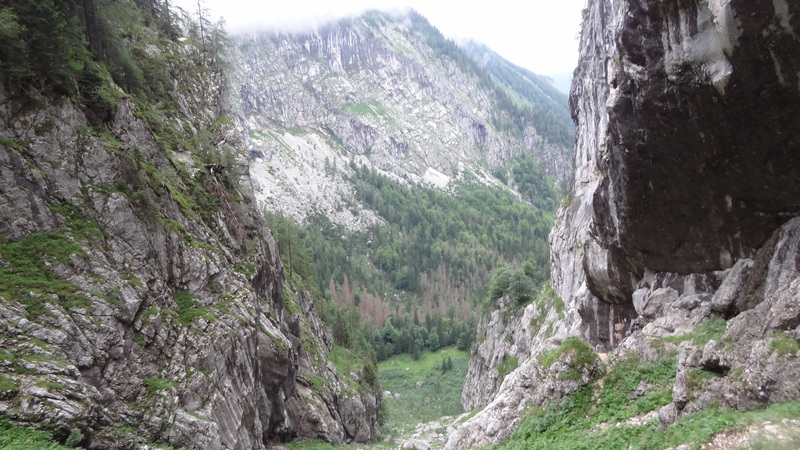 The journey would take us over the Königsee, and then on to a trail taking us to Riemannshaus and then to Ingolstädter Haus for the second night. 3. In the Allgäuer Alps (which is in fact the area where the Heilbronner Höhenweg is also). The trip would take us on the Krumbacher Höhenweg, and then onto the Mindelheimerhutte and then the Pfeishutte. I haven’t been to any of these areas before. I have been to Berchtesgaden and the Königsee, which I have to say are about as picture postcard beautiful as any place on this earth, but not the trail itself. Each of the regions are reasonably close. 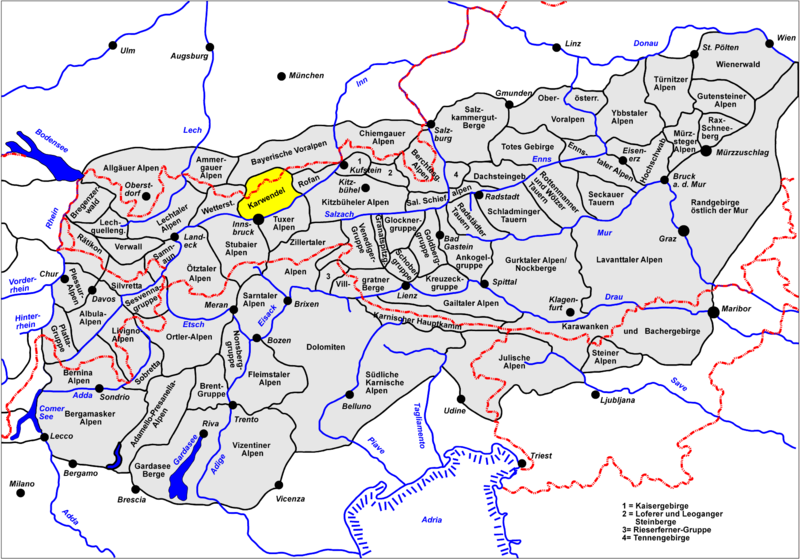 If you look at the map below of the Northern Limestone Alps you will see the Karwandel region (highlighted in yellow), and then close to its left you will see the Allgau and then the Berchtesgadener Alps to the right. Having googled extensively each of the three options, my head is now in a spin. The reason for that is that we sadly have to choose one of them, and I want to do all three! I suppose that I/we can always go back at another time, and in some ways it is so nice to be spoilt for choice. The good thing is that the weather appears now to be set reasonably fair. It should be warm for Friday and Saturday, with the chance of thunderstorms on Sunday. I’ll have to carry everything I need for the trip on my back (obviously), and so being a hopeless overpacker that could make for some tired shoulders by Monday, but so be it. We will apparently choose one of the three routes on Thursday after I arrive by plane to Munich. Perfect! Given the fact that I love travel, change, challenge, adventure, the mountains, and am going to new paths in one of the most beautiful areas in Europe, and moreover get to do so with someone that I know and like, then things can’t get a whole lot better as far as I am concerned. In the Karwandel range, this may actually be the Pleisen. I am tonight packing and unpacking my rucksack, very much in eager anticipation. And in fact I may be just as excited about this trip as I was for Everest Base Camp, it is just potentially a trip that has just so much to give. I’ll be there in less than 60 hours time, and yes I’m counting. It’s a bit of an overused phrase of mine, but I’ll say it anyway: “Bring it on”. Seven More Sleeps to Go! Please forgive the less than riveting title to this post, but it has just dawned upon me that it is in fact a true statement, so it has to be as good as any that I can come up with at this moment in time, given the fact that I am feeling hopelessly and outrageously underprepared for this trip. The unpreparedness comes now from a lack of training. I know, I know – I have said myself so many times that I must not make the mistake of not being fit, but the fact is I haven’t got it at the moment, and that is such a shame. I have been away too many times in the last two months, and have been lacking in the discipline that I should have had to make the most out of things. Going to the gym when you are in hotels is just not enough, and sometimes just doesn’t even happen. In the last two months I have had trips to Cannes, Paris, Dallas (twice), San Francisco, and Munich. I think I have been away from home for 16 of the last 22 days, which is ridiculous. I now am home from a week long trip and all of a sudden the Himalayas are therefore almost upon me. But prepared I must get in every other way that I can, so at least I turn up with the right equipment. There are probably three areas of most concern, apart from the fitness aspect. They are kit, medical supplies, and clothes. All of these stem mainly from the weight allowance of 15kg which I have been told is set in stone. As far as the kit itself is concerned, I think I am mainly there. I have for example about four jackets, one hooded permatex, one fleece, one goretex waterproof, and one down. I have my sleeping bag (borrowed from a friend Anna – thanks Anna :)), my Thermarest, down mits, balaclava etc etc. I will do another post on this – there is so much of it. I will be able to rent the majority of my technical climbing equipment when in Kathmandu. I have a lot of the medical stuff yet to get – painkillers, diarrhoea medicine, water purification tablets, blister plasters, wet wipes etc etc., and will do this at the weekend before I go. All of these things add up in weight of course, and so I have to be careful. I also have the not small matter of contact lenses to sort out – I use dailies when I go away, and so for 22 days I need at least (allowing for ones I drop or spoil etc) about 60 contact lenses. As far as clothes are concerned, well I have to see what I can put in after I get everythimg else in. I have a feeling though that I am going to end up one stinky guy at the end of 22 days! “What is so compelling about trekking through an unknown country is the immediacy of existence. Life is instantaneous. There is no past or future, only the present; and that consists of simply putting one foot in front of the other. That simple act can be achieved without conscious thought (if all is going well), or it can be the most difficult or painful exercise imaginable if the way is rough and you’re dogged by illness or injury. On the trail when things go well, the days expand and every moment is cause for celebration; the journey itself becomes intoxicating, life enhancing. It is the ultimate great escape. Not an escape from reality (as some might suggest), but an escape into reality – an opportunity to divest oneself of the restraints and clutter of ‘normal’ existence, and to be cleansed by an awareness of what little it takes to survive and live well – if only for a few short weeks in a year. I think the above is attributed to a guy called Kev Reynolds, an author of a number of books on Nepal and other adventures. I love the quote – I may have to read more of his stuff. It is getting a bit late for me to order any more books, and I certainly don’t have room for any more that’s for sure. The guy who talks there in the video, Simon, runs the place, and it was he who I then encountered at 6.30 in the morning, and the news he delivered was not, sadly, ‘music’ to my ears. He said that there was already about 25cm of fresh snow lying at a height of 2,000m, but that worse, there was expected about 1 metre (!) during the day, and that we “must go down”. This was awful. I knew he was right, and had to listen and respect what he said, but it was so sad to have come so far to do the Zugspitze, to find out that you couldn’t go there at all, despite being already half way. Sometimes though you just have to respect the mountain and the conditions, and there was no choice. I walked back into the dormitory and gave the news to Heather, who felt the same as me. In fact everyone who was staying there in the room and in the hut, had to suffer the same fate – we were all to go down and not up that day. So after a nice if rather slower and more sombre breakfast than we would have chosen, it was on with every piece of waterproof kit that we had. The view out outside was basically one of torrential rain, with no view of the mountain tops, but evidence of snow not far above us – what a change from the day before! A brave face outside the Reintalangerhutte before we headed off the 'wrong' way, down the mountain. The walk down was easy, punctuated only by passing walkers from the hut heading the same sad way as us. An interesting moment was had half way down, when a German guy pointed to the river and saw his sleeping bag floating downstream. This was made all the more strange by virtue of the fact that this was Saturday and he had dropped it upstream two days before! He managed to fish it out, and looked very pleased with himself as a result. By the time we got down to the Partnachklamm, after maybe three hours or so, the effects of the torrential rain could be seen in full force. The gorge was even more spectacular than the previous day, and the noise of the river that it now was made it even more incredible. No photograph that I could take or show here could do it justice, but you just had to stare open mouthed at the power of the whole thing. It was truly amazing. We reached the bottom of the mountain at about noon in the end, and stopped at a little restaurant for some outstanding Schnitzel (for me) and soup for Heather (she doesn’t eat mammals). The food was outstanding, (as was everything I ate in Germany) and was washed down with a rather pleasant glass of Lowenbrau – it is amazing how wonderful it tastes over there – I never drink lager at all at home, it is just so gassy and tasteless to me – but this was wonderful. So having reached Garmisch we looked for a place to stay, and stopped at the first place we came to, which was a lovely little hotel called the AlpenGruss, which we had passed on the way up. 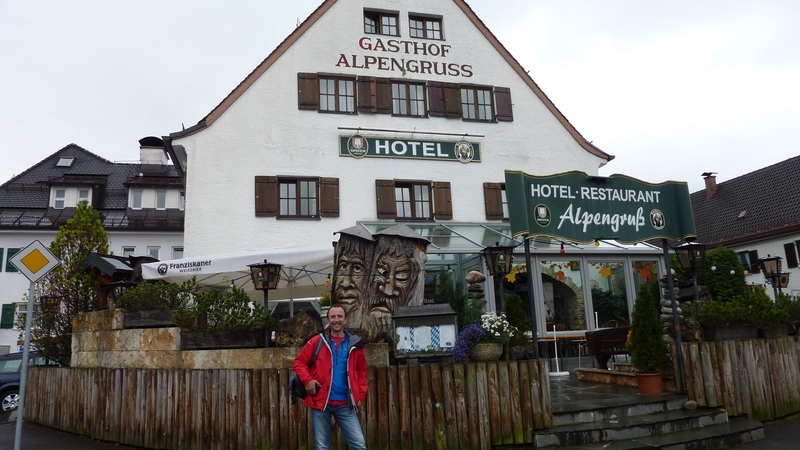 Hotel Alpengruss, Garmisch-Partenkirchen - perfect! With backpacks duly stashed it was straight out of the door again, and we were headed for only one thing – back to the mountain! Having not been able to climb the damn thing didn’t mean that we weren’t going to get to the top, and there was a cablecar somewhere, which we hoped would be operating. The owner of the hotel told us we had 20 minutes or so to catch it. So having found a train to take us to the other side of the mountain, by about 2.30pm we were hurtling up the mountain into the clouds on what is a stupidly scary cable car. 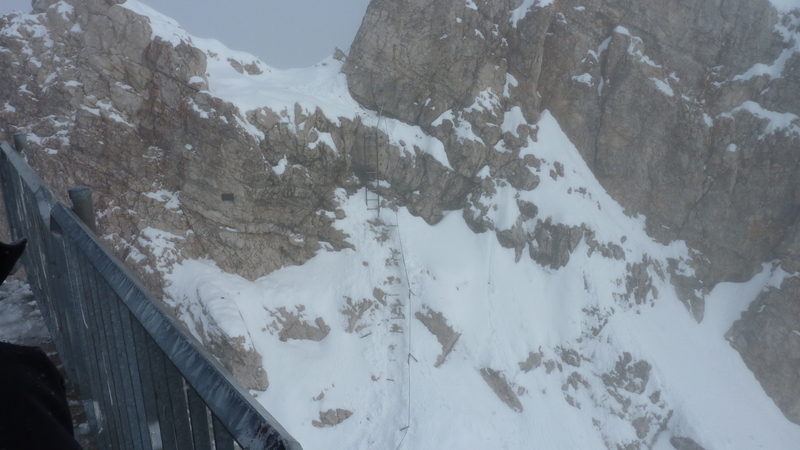 So the cable car took us to the very summit of the Zugspitze. The cable car station just looks like it shouldn’t or couldn’t have been built there. It perches so ridiculously precariously on the top of the mountain that it looks like it should collapse or fall off at any moment. Just looking over the side of the railings from the restaurant gave me vertigo. 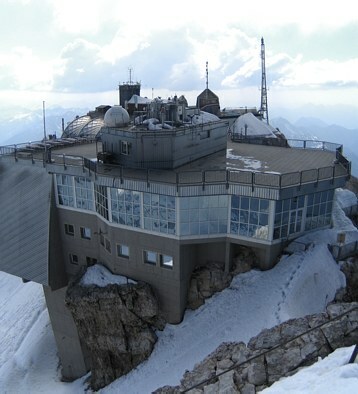 The Zugspitze cable car station/restaurant - pretty it certainly is not. So at the cable car station there was huge anounts of freash snow, and we realised just how impossible our attempts would have been even if we had been stupid enough to try to ignore the advice we had been given earlier that same morning. There is literally no way that it would have been possible. But, after all, we were there, and it was wonderful just to have that feeling you get when you are on top of a mountain. And this one, believe me, is very very special. 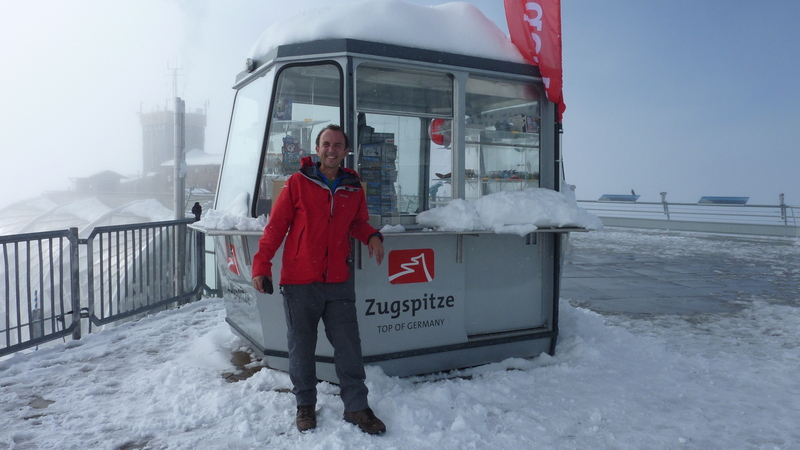 The top of the cable car station, 2,962 metres, the roof of Germany. The iron ladder leading to the very top. It was not going to happen sadly. One slip from here and you would be dead, simple as that. It was an easy choice in the end not to go up there. The top of the mountain straddles the border of Austria and Germany, and in the restuarant on the Austrian side of the mountain they were having their own Oktoberfest! I would have loved to have stayed and had a beer, but unfortunately that would have meant missing our cablecar down, as the last one was at 4.45pm – shame! There was however a view of sorts of the glacier, the only one in Germany, and we were glad at least to have safety now on our side. For me it was a moment of pure reflection. I was very glad to be at the highest point in Germany, disappointed that I hadn’t got there under my own steam, but very glad to be safe, and respectful of the mountain and the elements, which will, if they decide to, always beat you in the end. So we left via another cable car off the other side of the mountain, and then back into Garmisch via the funicular railway. The journey was ridiculously pretty, the area is totally beautiful, and I vowed, promised myself, that I would be back. What do they say in Slumdog Millionnaire – “it is written“? – well I believe that it most certainly is.